(1) Excerpt from The Seeker’s Mind by Sri Chinmoy. (2) Excerpt from Prayer-World, Mantra-World And Japa-World by Sri Chinmoy. (3) Excerpt from Meditation: Humanity’s Race And Divinity’s Grace, Part 2 by Sri Chinmoy. (4) Excerpt from Meditation: God Speaks And I Listen, Part 1 by Sri Chinmoy. (5) Excerpt from My Heart’s Salutation To Australia, Part 1 by Sri Chinmoy. (6) Excerpt from Two Divine Instruments: Master And Disciple by Sri Chinmoy. (7) Excerpt from A Sri Chinmoy Primer by Sri Chinmoy. (9) Excerpt from:Seventy-Seven Thousand Service-Trees, Part 7, by Sri Chinmoy. Agni Press, 1998. 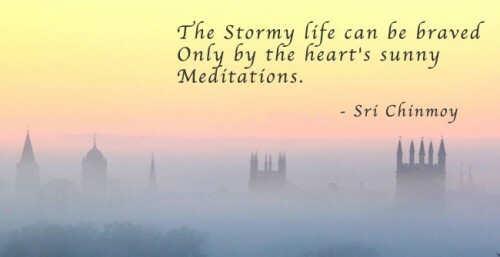 (11) Sri Chinmoy, I Meditate So That, Agni Press, 1982. (12) Sri Chinmoy, Arise! Awake! Thoughts Of A Yogi, Agni Press, 1972. (13) Sri Chinmoy, My Prayer-Life My Meditation-Heart, Agni Press, 1999. (17) Sri Chinmoy, Meditation: God’s Duty And Man’s Beauty, Agni Press, 1974. (18) Sri Chinmoy, Eastern Light For The Western Mind, Agni Press, 1973. (19) Sri Chinmoy, Yoga And The Spiritual Life. The Journey of India’s Soul., Agni Press, 1971. (20) Sri Chinmoy, Experiences Of The Higher Worlds, Agni Press, 1977.